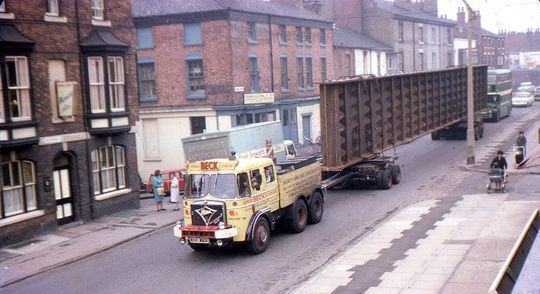 In 1967 Edward Beck & Son Ltd were given the task of moving a number of 100 foot long steel sections manufactured by Wellman Structures Ltd of Globe Lane Dukinfield. Each individual load required a movement order detailing the route from Dukinfield Cheshire to Scunthorpe in Lincolnshire. 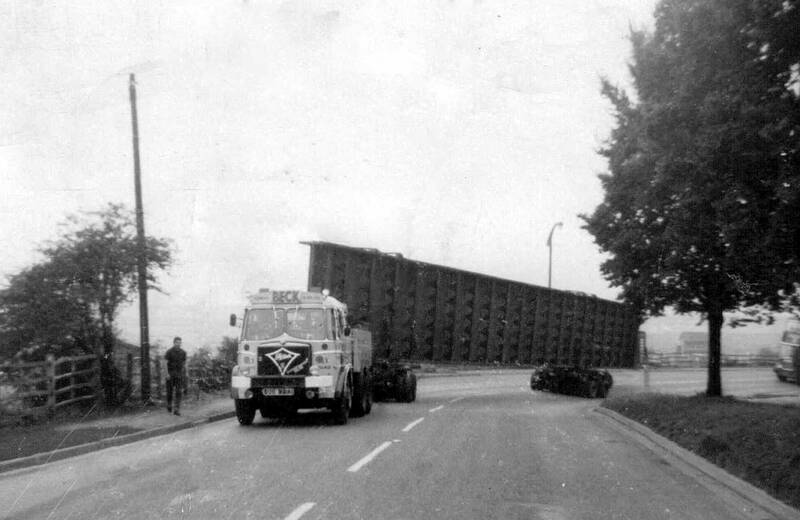 In the days before the motorway network was built the routes taken by abnormal loads in those days was quite complex avoiding low bridges, narrow turns, hump back bridges, tight road junctions etc etc. On leaving Globe Lane Dukinfield turn left on to the B6169 Astley Street then left onto the A6017 to the junction with the A57. Turn right onto A57 via Denton to Manchester onto the A6 Ardwick Green South, Downing Street, London Road and Piccadilly (part). Turn right onto Newton Street turn left onto A665 Great Ancotes Street then right onto A62 Oldham Road up to the A663 Broadway. Turn left onto A663 Broadway and continue via Chadderton to the A627 at Royton. Turn right on to A627 Rochdale Road to Oldham then left on to A62 West Street, Market Place, High Street, Yorkshire Street. Mumps Bridge, and Huddersfield Road continuing on the A62 to Huddersfield via Scouthead, Delph, Standedge, Marsden and Slaithwaite. Through Huddersfield via the A62 Manchester Road the route continued on until Cooper Bridge Road turning right onto Leeds Road through Liversedge and Birstall to the junction of the A650 Bradford Road. Here it was on towards the Leeds outer ring road eventually arriving at the A64 York Road and out East to the A1 at Bramham Moor. Once on the A1 South it was plain sailing all the way down to Newark until a left turn onto the A46 and on towards Lincoln. Through the centre of Lincoln via the A46 Newark Road, Monks Road and Ruskin Avenue eventually joining the A15 on the North side of Lincoln. After joining the A15 it was North to the A18 at Brigg via Caenby Corner until the A1029 were it was a right turn towards the entrance of the Appleby Frodingham steel works entrance at Scunthorpe. 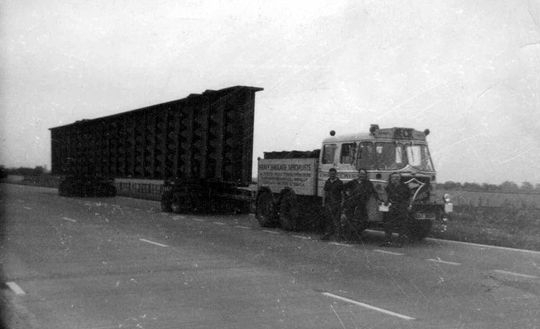 The crew of the 'Big Bopper' take time out for a photograph on the A1 in Yorkshire during the transportation of the 100 foot overhead gantry section destined for the Appleby Frodingham steel works at Scunthorpe. The 100 foot long load negotiates a left turn in Yorkshire as second mate/steersman Steve Phillips walks along side as it prepares to go down an incline. 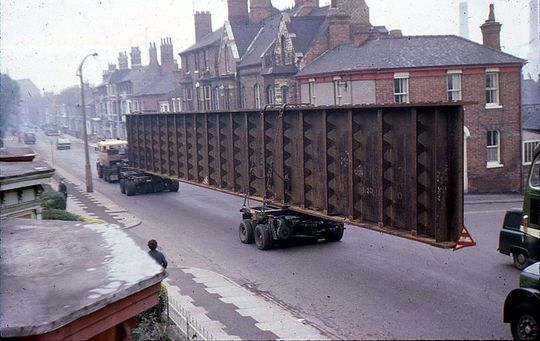 Hauled by the 'Big Bopper' the 100 foot long crane gantry section is seen here on the B1308 Monks Road in Lincoln as it heads for the A15. Viewed best at full size by clicking on the image this superb photograph was taken by the late John Charles Walker who sadly passed away in 2005. The 100 foot long crane gantry section, destined for Scunthorpe, heads east down the B1308 Monks Road in Lincoln. 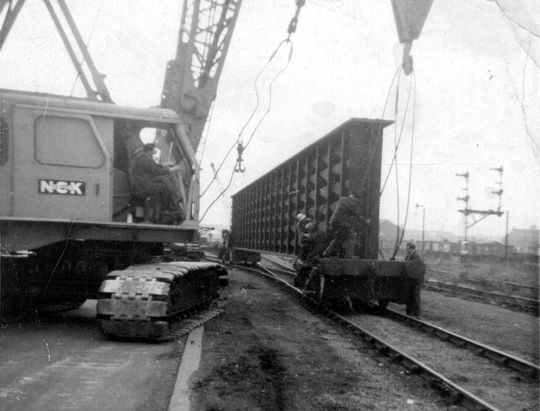 Beck's own engineer Bill Latham measured and designed the special clamps that enabled the girders to be safely attached to the Crane bogies for the long journey over to Lincolnshire. On arrival at the Appleby Frodingham steel works at Scunthorpe the 100 foot long section was transferred on to Appleby Frodingham Steel Works own internal railway system for the final leg of its journey. Photograph courtesy of Steve Phillips.